A dear friend of mine sent me a set telling me that THIS is the whiskey glass of all time as opposed to the Glencairn glasses I routinely use. So, tonight I thought I would try it out with two whiskeys that are very familiar to me, and ended up adding a third to confirm what I thought. My first pour was Weller 107, a delightful wheat recipe Bourbon with a little bit of punch due to the proof. In the Norlan glass a lot of the subtle sweet flavors were lost. The wider brim and less tulip shape of the glass probably account for that; the Norlan is somewhere in between the Glencairn and the Reidel single malt glass as far as shape, with these unique wings in the bottom of the glass that help dissipate the alcohol. Apparently it dissipates the subtle scents and flavors of some whiskeys, and not in a good way. However, pour some 1792 Full Proof which requires a huge amount of swirling to tone down the whiskey to make it really enjoyable, or Stagg Jr., a barrel proof bruiser of a bourbon that separates the men from the boys, and the experience is entirely different. 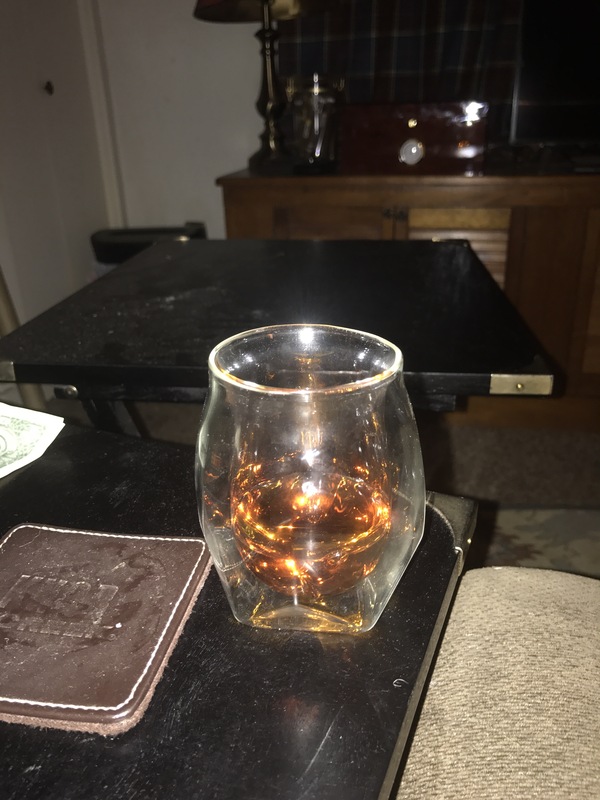 The Norlan glasses mellow out the whiskey such that it become truly enjoyable from the first sip. The Stagg Jr., which I absolutely love, was made dangerous with this glass. The nose becomes just amazing and the whiskey becomes mellow and easy to drink. In short, this glass is not the glass for nosing and tasting great whiskey, unless it is cask strength or something close to it. Then it is THE glass for that.